M T D D e c e m b e r 2 0 1 8 50 2 0 1 8 S E M A S h o w BARTEC AND TCS PAIR UP Bartec USA LLC is combining the capabili- ties of its Tech200Pro tool with soware provider TCS Technologies. It's the first time Bartec has integrated any of its tools with a soware company, and Bartec believes it will help tire retailers talk to consumers about the condition of their tires and tire pressure monitoring systems (TPMS). Scot Holloway, CEO of Bartec, said, "It starts with our tools. We built in wireless technology." e tool reads signals like sensor fail codes, tire pressure and tread depth. And then those signals are translated into a consumer-friendly report that a salesperson can show on a monitor at the front counter or on a larger monitor in the showroom. e sales team also can generate a printout to give to the consumer. Failed sensors are marked with a red warning label, and ones performing adequately are labeled green. e tools capture the data and relay it to the TCS Digital Inspections app, as well as the Tireworks HD soware interface. 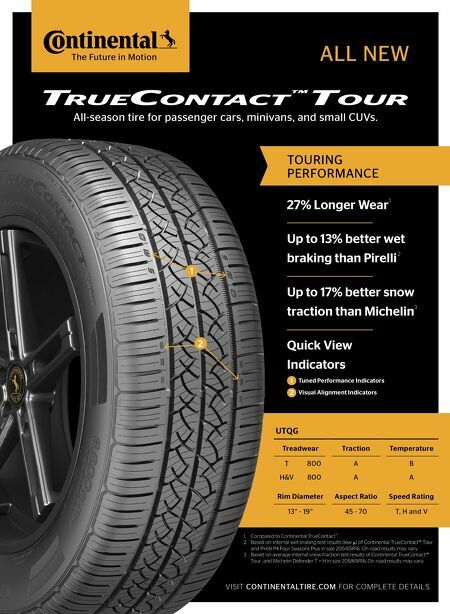 Bartec said consumers can make better and more informed decisions when they know the precise condition of their tires and TPMS system. Holloway said "front counter people are missing opportunities" to sell sensors and TPMS components. He said tire dealers need to follow a basic rule: "If a car has TPMS on it, you need to inspect it." is technology will help tire dealers talk about TPMS sensors, and "at the end of the day tire shops are going to sell more tires," Holloway said. A NEW WAY TO REMOVE OLD FASTENERS Removing an old, worn or weathered fastener no longer requires any hammering, thanks to what Apex Tool Group LLC calls an uncommonly simple solution to this common problem — GearWrench Bolt Biter Extraction Sockets. e extraction sockets don't cut or dig into rounded, damaged fasteners with one-direction spiral blades like other extraction sockets do. Instead, the Bolt Biter is designed as a set of incrementally- sized sockets with tapered, internal flutes. ey slide over stripped and corroded fasteners and grip the rounded sides and remove them. And because the removal process doesn't destroy the fastener, it can actually be The Tire Industry Asso- ciation (TIA) announced two new initiatives for its members. They include a health benefits program for employees. Through an alliance with National General Benefits Solutions, TIA is able to offer flexible group health insurance. "Basically it's a self-funding program," said Tim Chandler III, TIA's health benefits manager. "It's ideal for small and midsize busi- ness owners (with from) two to 200 employees." The program, which is de- signed to be "to be efficient and cost effective," includes the following options: • Core Value Plan. The ref- erence based pricing plan pays providers based on a multiple of the Medicare re- imbursement rate (or other derived equivalent) regard- less of the billed amount. It is not associated with any networks, so members have the freedom to use any pro- vider they choose. • Core Value Flex. The lev- el-funded, reference-based pricing option allows mem- bers to choose a reference- based pricing plan, with the option of switching to a PPO network mid-year without a change in monthly payment. "If you max out your cov- erages for the year, you are not liable as a business owner to pay for anything that exceeds your maximum coverage," said Chandler. In addition, if you have a low claims year, you will get a refund. For more information on the program, contact Chan- dler at tchandler@tireindus- try.org. TIA also is developing new 100-level introductions to both its ATS (Automo- tive Tire Service) and CTS (Commercial Tire Service) training programs. 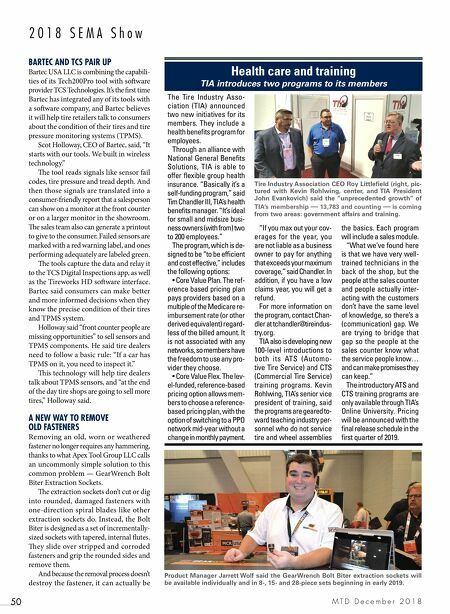 Kevin Rohlwing, TIA's senior vice president of training, said the programs are geared to- ward teaching industry per- sonnel who do not service tire and wheel assemblies the basics. Each program will include a sales module. "What we've found here is that we have very well- trained technicians in the back of the shop, but the people at the sales counter and people actually inter- acting with the customers don't have the same level of knowledge, so there's a (communication) gap. We are trying to bridge that gap so the people at the sales counter know what the service people know… and can make promises they can keep." The introductory ATS and CTS training programs are only available through TIA's Online University. Pricing will be announced with the final release schedule in the first quarter of 2019. Health care and training TIA introduces two programs to its members Tire Industry Association CEO Roy Littlefield (right, pic- tured with Kevin Rohlwing, center, and TIA President John Evankovich) said the "unprecedented growth" of TIA's membership — 13,783 and counting — is coming from two areas: government affairs and training. Product Manager Jarrett Wolf said the GearWrench Bolt Biter extraction sockets will be available individually and in 8-, 15- and 28-piece sets beginning in early 2019.